There’s no arguing the fact that a good spice organizer can reduce clutter and make working in the kitchen easier. But most spice racks are unattractive, inconvenient, or hog countertop space. As a result, homeowners resort to digging through cabinets and drawers for their frequently used spices. We’ve designed a simple spice organizer that takes care of all these problems and more. The project uses a set of magnetic spice jars to create an all-in-one station that holds your favorite spices and measuring spoons. It attaches to the wall between your countertop and upper cabinets, making use of space in your kitchen that usually goes to waste. The best part of this project is how easy it is to build. You don’t have to be a champion woodworker to pull it off. We’ll show you how to make and mount your own in a few steps. Plus, we’ll give you the dimensions to build a larger version in case this one can’t contain all of your favorite spices. 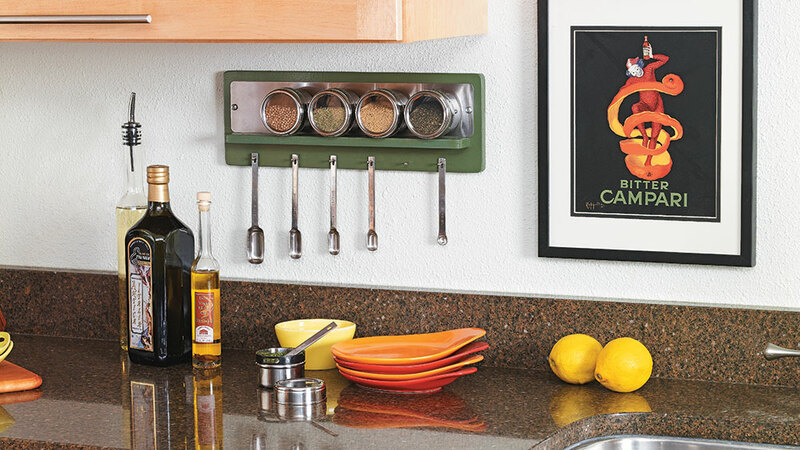 The spice center’s base consists of two parts: the back, which gets mounted to the wall, and the ledge, which helps you line up the spice jars to give the project a cleaner look. Spice Jar Set. 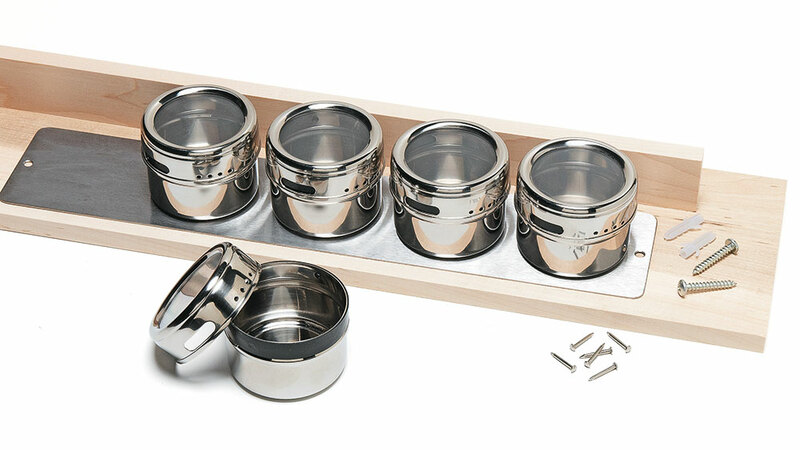 Buy a stainless steel set that includes magnetic spice jars, a metal strip, and mounting hardware. Measuring Spoons. Choose a set of sleek spoons with holes in the handles. Craft Wood. 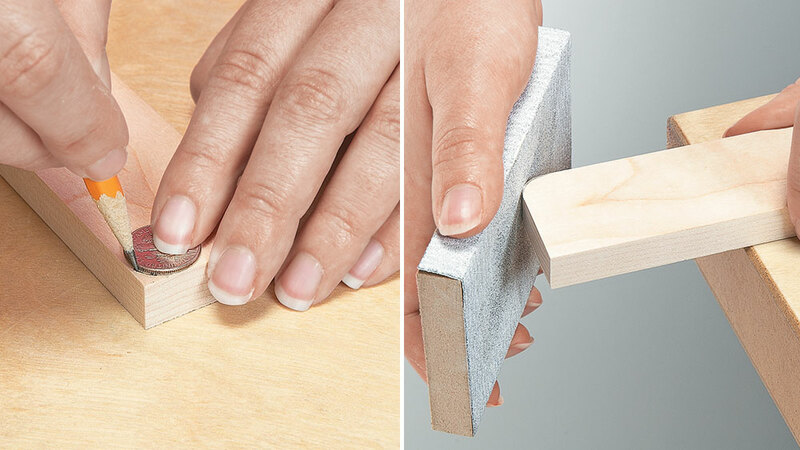 Pick up two pieces of craft wood from the home center to make the base of the project. Window Shade Bracket Nails. Use these as hangers for your measuring spoons. The first step is to cut these pieces to size from craft wood. If the single rack doesn’t offer enough space for your favorite spices, build a double version that incorporates two spice sets. Once the wood is cut, round the front corners of the ledge and all four corners of the back. Then run glue along the spice center’s ledge, and press it in place. Next, find and mark the locations of the shade bracket nails. Pre-drill 1⁄16" holes for them. Then use the pre-drilled holes on the spice set’s metal strip as guides to mark holes on the base, and drill them. With the base complete, you can paint it and drive the shade bracket nails into the holes. To mount the project, insert wall anchors into your wall, and then install screws through both the metal strip and the base. You can use a sanding block to round the corners of the spice center’s back and ledge. To get consistent results for all of the corners, trace the edge of a dime at each corner first. Then sand the craft wood down to the line. 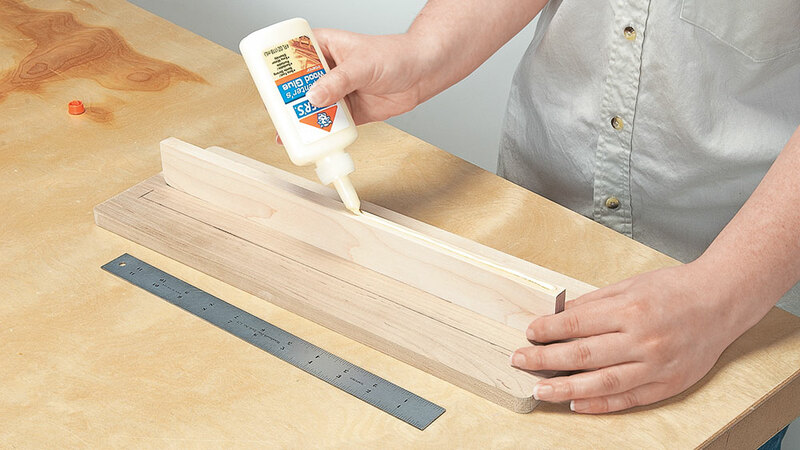 Since the spice jars won’t put much pressure on the ledge, wood glue will be strong enough to connect it to the back. Just run a bead of glue along the back of the ledge, and then press it in place 11⁄2" from the bottom of the back piece. Wipe off any excess glue. 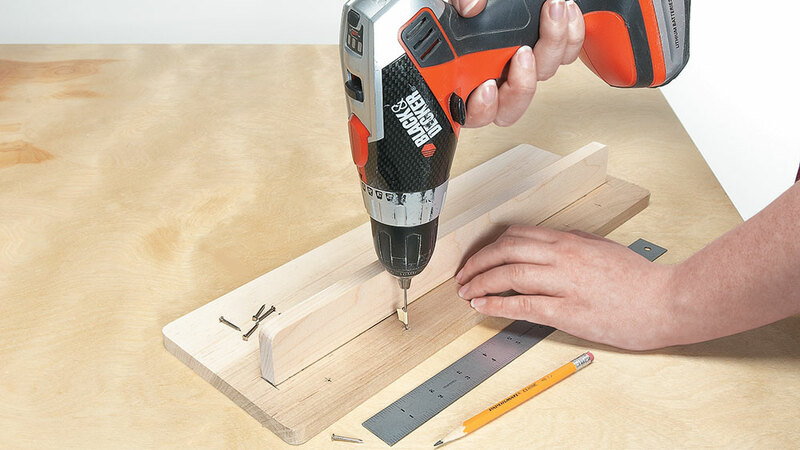 You’ll need a 1⁄16" drill bit to pre-drill holes for the window shade bracket nails. We decided to vary the spacing between the nails as shown. It may seem odd, but varying the spacing actually makes the spacing of the spoons look consistent. You’ll drive the nails into the holes after you drill mounting holes and paint the base. 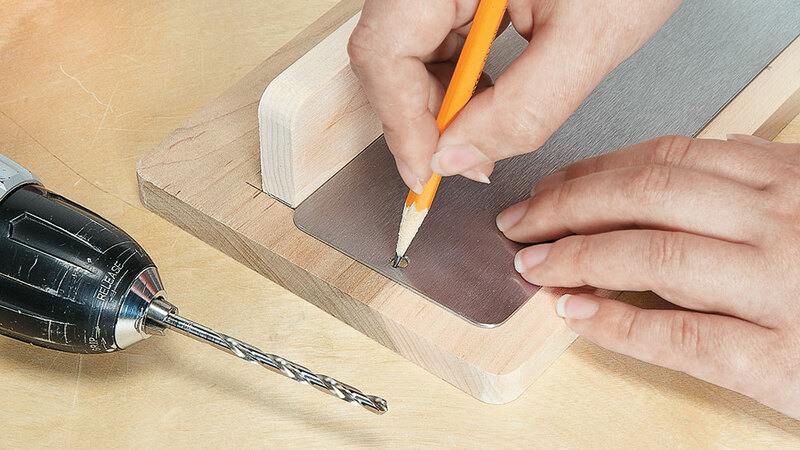 The metal strip that comes with the spice jar set is pre-drilled for mounting, so use it as a template to mark holes on the base. To mount the project, you’ll install screws through the holes in both the metal strip and the base.